In 1956, BMW released the 507, a stunning two-seat Roadster that delivered exhilarating performance, luxury, and rarity. The car undoubtedly remains one of the most coveted BMW models ever produced. 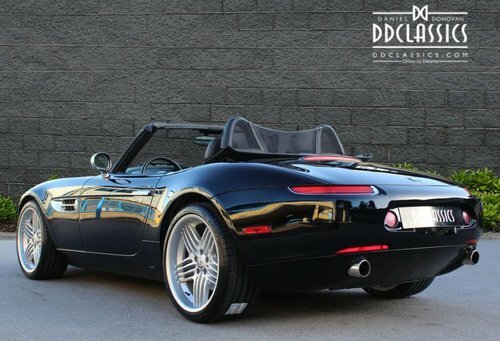 The Z8 was designed during the 1990s under the watchful eye of Chris Bangle, the recently arrived head of BMW’s design department, although it’s retro lines were actually penned by Henrik Fisker. 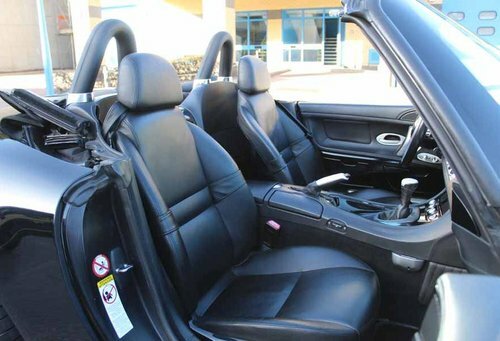 The precursor to the Z8 was exhibited at the 1997 Tokyo Motor show as the Z07 Concept and it was actually two cars – a retro-styled roadster and a similarly nostalgic coupe. The concept was a feast of design indulgence with its curving bodywork, wide stance and a flying buttress helmet fairing on the roadster and double-bubble roof on the coupe. There was no denying the similarities between the Z07 and the classic 507 of the Fifties. Looking at the cars side-by-side, the Z07 was a modern homage to the classic BMW and they shared numerous styling cues – the split front grille, the shape of the bumper and the bonnet, the side vents and the raised rear shoulder line. As far as modern interpretations went it was spot on, although at the same time it wasn’t the most coherent of shapes and lacked the 507’s ultimate style and grace. The Z8 had all the right ingredients – retro looks, the E39 M5’s 4941cc V8, a separate space frame chassis and aluminium bodywork. BMW did not have the production capacity to build the model in-house as the Z8’s chassis was made at its Dingolfing plant, before being sent to Munich where its assembly was almost completely done by hand. 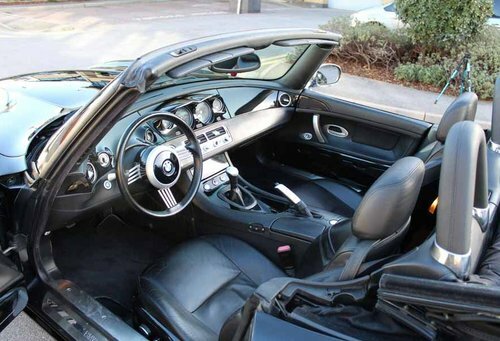 In result, the Z8 took ten times longer to manufacture than a contemporary 3-series saloon. In total, BMW manufactured 5703 Z8s between 1999 and 2003 and if you think you’ve only ever seen a silver one that does not come as a surprise. In fact, 3182 cars were finished in the launch (and Bond) colour of Titanium Silver. Other colours available included black (just over 1500 cars) Topaz Blue, Red and Stratus Grey, along with nearly 125 cars painted by BMW’s Individual department. 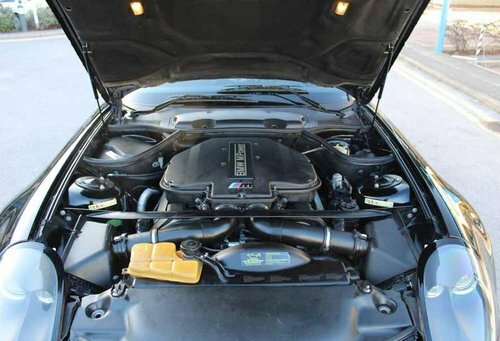 Under the Z8’s retro bonnet you will find the S62 4941cc V8 from the E39 M5. No changes were made for its Roadster application and thus it is able to develop 394bhp and 369lb ft of torque. It was BMW’s first M Power V8 and was extensively modified for its M5 and Z8. It retained the hydraulic self-adjusting tappets of the parent engine making it the first M power unit that didn’t require for its shims to be redone when it required major servicing – just as well as there would have been 32 to do. It did, however, have plenty of the normal M touches like individual throttle butterflies (electronically actuated for the first time) along with bespoke pistons, crankshaft, conrods making a superb engine – tuneful, powerful and torquey. The gearbox was also donated by the M5 – a Getrag six-speed manual – tough and precise, albeit with a slightly long throw. Perhaps the biggest talking point was BMW’s decision that the Z8 could do without the limited-slip differential that was intrinsic to the M5’s make-up. The Z8 featured an all-aluminium space frame construction – unlike every other modern BMW – chosen for its lightness, strength and impressive impact performance. The suspension used MacPherson struts and lower wishbones at the front with a five-link rear setup at the rear and wherever possible aluminium was used to keep weight down. With the panache and style from BMW’s most famous sports car, the 507 roadsters, the Z8 was fused with modern twist and engineering. Completely hand assembled- a reflection of the importance BMW placed on the legacy of the Z8, it took ten times longer to manufacture than a contemporary 3-series. The example on offer here is finished in Jet Black coachwork with special order, Black Nappa leather and Anthracite headlining. Factory options include a 6-speed Getrag manual gearbox, Harman Kardon speakers, Bi-Xenon headlights, Sports steering wheels with chrome spokes, a colour coded demountable hardtop, fully electric heated seats and 20-inch light alloy Alpina wheels. 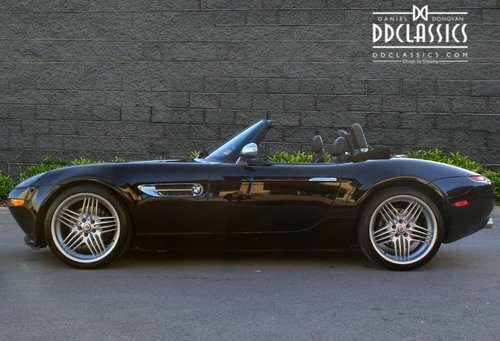 It was delivered new via South Motors BMW Miami where this ultimate driving machine resided for it’s entire lifetime prior to DD Classics acquisition. This Z8 is now fully UK road registered and sitting on 4 brand new 20 inch Alpina light alloy sport wheels and new tyres. This is a rare opportunity to acquire a genuine one owner example from new, in the best colour combination of Jet Black with Black Nappa hide. Offered for the first time, complete with original drivers handbooks, Z8 embossed leather wallet, 2 sets of keys, factory supplied service book and original bill of sale, all on file. Early viewing is highly recommended to avoid disappointment. European Delivery Tripple Black All Books , Tools , Covers ..... 1 owner never touched ..... one of a Kind !! 2000 BMW Z8. 36,000 Miles. One Careful Owner From New. Silver / Black Leather Interior. Full BMW Service History. Hard Top Included. First Registered In Andorra. Now Available For Viewing In Mallorca. £195,000. Please Call For More Details. Part Exchange Considered. 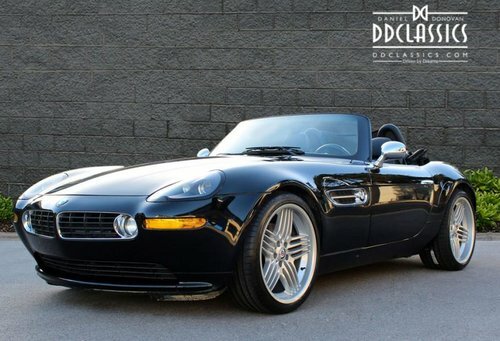 2000 BMW Z8 German car, only 28.722 kms!